Meter readings and energy-saving notes for dual fuel use at home in 2011. Heating demand has dropped each year even though winters have not been getting milder, and peak daily heating load has dropped about 40%. 2011 data (kWh: e used 1578, e gen -3998, g 3936). 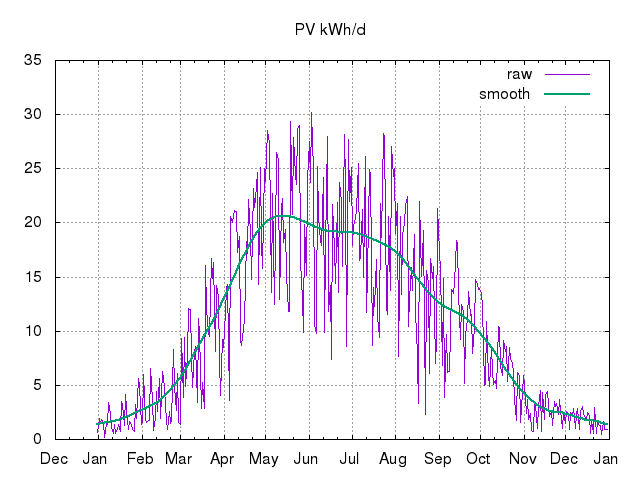 See the daily PV generation logs for 2011 as .csv and .png chart. Also in August I reviewed the AlertMe energy-monitoring kit for The Register. Amongst other things, it has convinced me that our "always on" electricity load / baseload is ~70W, mainly the fridge I suspect. The near-1.0 R/correlation figure implies that we are efficient, using heating based on actual external temperature. If our DHW and cooking were separate this might be even closer to 1. The baseload seems to be a weekly kWh figure, ie ~4kWh/d for DHW/cooking, which is about right. The slope of 2.89, presumably kWh/HDD, is again fairly close to the 3kWh/HDD measured and used as a target. Possibly I should lower our target a little, especially as the data used goes back to 2009 and we've been improving! Note that the (high-heat-demand) points at the right-hand end are all from around the exceptionally cold start and end of 2010. Having gone back and entered data for previous meters I now have a 4-year energy chart from autumn 2007 to end-summer 2011. Heating demand has dropped each year even though winters have not been getting milder. Peak heating demand has dropped from ~63kWh/d in 2007/12 to ~38kWh/d in 2011/01. The electricity meter from 2008/02 to 2009/09 was unratcheted and imeasure objects to readings going backwards so that part of the chart is dubious (subtracting our next export from PV generation for the period gives ~3.1MWh consumption for that period, not including what was used locally). The extra historical data has adjusted our performance-line heating numbers to Baseload = 52.33 Slope = 3.17 R = 0.810, ie the old data makes us look worse now! I discovered that I have lost all meter readings for 2009/07: annoying! An implication of this, with 3kWh/HDD12 and a typical 1070HDD12 year (3.21MWh), and the fact that our current gas combi is actually only ~80% efficient, is that our true heat demand for CH is now ~2.5MWh/y (and falling). That's somewhat over the heat storage capacity of one mythical buried milk-tanker (20kl/20t) at a delta-T of 80K (~90kWh/t for a delta-T of 80K, ~1.8MWh/tanker). A couple of tonnes (~60kWh/t at a delta-T of 50K, thus ~120kWh) could carry enough from mid-summer into autumn to postpone using gas for DHW for an extra month or so. Note that the SheevaPlug stayed off-grid all year after the battery upgrade. (And some more tweaking of software to use less energy in the darkest periods.) And I haven't seen the controller light on amber or red even in December. Carbon footprint for heat'n'light this year indicates, mainly due to the milder weather, that we're slightly carbon-negative (circa -300kgCO2 for the house for 2011), which is good. Definitely not Passivhaus. But with heating at ~50kWh/m^2/year (ie gas use at <4MWh/y cf national average of 18MWh/y) I don't think we're doing too badly. Disappointingly our gross electricity consumption has gone up a tiny bit. HDD12 for year 820, much lower than previous years, with gas consumption ~3936kWh. So if baseline (DHW+cooking) is still 5kWh/day that leaves 2111kWh for space heating, or a little under 2.6kWh/HDD12. That can guide next year's target (down from 3.0kWh/HDD12). As of 2011/12/31 imeasure.org.uk is claiming Baseload = 50.46 Slope = 3.17 R = 0.810 under Weather Analysis. Electricity targets could be tightened a little too. Maybe more like 4kWh/d+0.15kWh/HDD12 (with mean consumption currently ~4.3kWh/d over the year). 2011/01 159 (5.1/d) -60 (-1.9/d) 816 (26/d) 20101231-18:06-GMT to 20110131-18:23-GMT (31d) Meter readings: electricity generation 59.9kWh, export 38.1kWh, import 137.0kWh (thus net consumption (I+G-E) 158.8kWh); gas ~73.5m^3 (so 816kWh @ 11.1kWh/m^3). SheevaPlug on grid (on mains electricity) about 8 days in total this month; new larger off-grid storage (~21d) should reduce on-grid time next winter! Electricity/gas targets met for month (though missed one week in the month). 2011/02 132 (4.7/d) -96 (-3.4/d) 574 (20/d) 20110131-18:23-GMT to 20110228-18:30-GMT (28d) Meter readings: electricity generation 96.2kWh, export 70.7kWh, import 106.9kWh (thus net consumption (I+G-E) 132.4kWh); gas ~52m^3 (so 574kWh @ 11.1kWh/m^3). Electricity targets met for month, gas targets just missed. 2011/03 158 (5.1/d) -284 (-9.2/d) 518 (17/d) 20110228-18:30-GMT to 20110331-17:20-GMT (31d) Meter readings: electricity generation 284.0kWh, export 239.2kWh, import 112.8kWh (thus net consumption (I+G-E) 157.6kWh); gas ~47m^3 (so 518kWh @ 11.1kWh/m^3). Central heating off for the last few days of the month. Electricity and gas targets met for month. 2011/04 122 (4.1/d) -518 (-17/d) 181 (6.0/d) 20110331-17:20-GMT to 20110430-17:12-GMT (30d) Meter readings: electricity generation 518.0kWh, export 465.8kWh, import 70.1kWh (thus net consumption (I+G-E) 122.3kWh); gas ~16m^3 (so 181kWh @ 11.1kWh/m^3). Moved ADSL modem/WiFi off-grid early this month, saving maybe 0.2kWh/d mains. Total generation from the initial rounds of PV passed 7MWh and on the newest round passed 1MWh this month. 2011/05 124 (4.0/d) -648 (-21/d) 176 (5.7/d) 20110430-17:12-GMT to 20110531-17:26-GMT (31d) Meter readings: electricity generation 647.7kWh, export 585.2kWh, import 61.1kWh (thus net consumption (I+G-E) 123.6kWh); gas ~16m^3 (so 176kWh @ 11.1kWh/m^3). Moved ADSL modem/WiFi back on-grid mid month since main battery getting low. Passed 9MWh total generation at the end of the month. 2011/06 120 (4.0/d) -591 (-20/d) 166 (5.5/d) 20110531-17:26-GMT to 20110630-17:08-GMT (30d) Meter readings: electricity generation 590.5kWh, export 531.7kWh, import 60.9kWh (thus net consumption (I+G-E) 119.7kWh); gas ~15m^3 (so 166kWh @ 11.1kWh/m^3). Passed 8MWh generated on the first generation meter and 5MWh exported. 2011/07 122 (3.9/d) -587 (-19/d) 155 (5.0/d) 20110630-17:08-GMT to 20110731-17:15-GMT (31d) Meter readings: electricity generation 587.3kWh, export 527.5kWh, import 62.4kWh (thus net consumption (I+G-E) 122.2kWh); gas ~14m^3 (so 155kWh @ 11.1kWh/m^3). SunnyBeam showing 9999.10kWh generated up to night of 2011/07/30; end of month generation readings sum to 10189.3kWh with 10022.3kWh on SunnyBeam. Carbon footprint so far for 2011 = approx -440kgCO2 ie negative; from ~490kgCO2 (gas) and -930kgCO2 (electricity). HDD12=1 vs 0 last July. 2011/08 103 (3.0/d) -525 (-15/d) 105 (3.1/d) 20110731-17:15-GMT to 20110903-17:12-GMT (34d) Meter readings: electricity generation 524.8kWh, export 480.1kWh, import 58.3kWh (thus net consumption (I+G-E) 103.0kWh); gas ~9m^3 (so 105kWh @ 11.1kWh/m^3). Away on holiday thus EOM readings delayed and consumption low. Metered exports passed 6MWh and generation on the first meter passed 9MWh. 2011/09 123 (4.6/d) -313 (-12/d) 163 (6.0/d) 20110903-17:12-GMT to 20110930-17:15-GMT (27d) Meter readings: electricity generation 313.0kWh, export 267.4kWh, import 77.8kWh (thus net consumption (I+G-E) 123.4kWh); gas ~15m^3 (so 163kWh @ 11.1kWh/m^3). Electricity target met for month, gas not. HDD12=6 (for all September) vs 19 last September. 2011/10 134 (4.3/d) -223 (-7.2/d) 170 (5.5d) 20110930-17:15-GMT to 20111031-18:28-GMT (31d) Meter readings: electricity generation 222.8kWh, export 186.9kWh, import 98.2kWh (thus net consumption (I+G-E) 134.1kWh); gas ~15m^3 (so 170kWh @ 11.1kWh/m^3). Heating not turned on this month. HDD12=31 vs 62 last October. 2011/11 149 (5.0/d) -87 (-2.9/d) 347 (12d) 20111031-18:28-GMT to 20111130-18:04-GMT (30d) Meter readings: electricity generation 86.6kWh, export 61.4kWh, import 122.9kWh (thus net consumption (I+G-E) 148.9kWh); gas ~31m^3 (so 347kWh @ 11.1kWh/m^3). Electricity and gas targets just missed for month. HDD12=66 (second warmest UK November and autumn on record) vs 185 last November (and 78 the previous November). 2011/12 136 (4.4/d) -57 (-1.8/d) 566 (18/d) 20111130-18:04-GMT to 20111231-18:12-GMT (31d) Meter readings: electricity generation 57.3kWh, export 36.5kWh, import 116.6kWh (thus net consumption (I+G-E) 136.4kWh); gas ~51m^3 (so 566kWh @ 11.1kWh/m^3). SheevaPlug still off-grid with plenty of juice in the main battery bank. HDD12=154 vs 340 last December (and 250 the previous December). 1578 (4.32/d) -3988 (-10.9/d) 3936 (10.8/d) 20101231-18:06-GMT to 20111231-18:12-GMT (365d) Electricity import (1081kWh) and consumption close to 2010, generation up 10%. Electricity bill reports import for 2011 was 1093kWh with predicted costs for 2012 at current rates £192 (@~13p/kWh+sc). Gas consumption down more than 30% on last year with HDD12 down ~45% (to 820); Space heating demand has dropped to ~2.6kWh/HDD12 (from 2.7 last year). DHW has accounted for approximately 50% of gas/heat demand this year, so solar thermal to as much as halve that is looking increasingly attractive. Gas bill reports consumption for 2011 was 4168kWh with predicted costs for 2012 at current rates £286 (@~4p/kWh+sc). 678kg (1.9/d) -1715kg (-4.7/d) 748kg (2.0/d) ~-0.29tCO2 (~-0.79kgCO2/d) gas/electricity emissions total for 4 people, based on 0.43kgCO2/kWh for electricity (netted) and 0.19kgCO2/kWh for gas, ie slightly carbon negative. First published 2011-01-01 , updated 2019-04-22 . Site copyright © 2007-2019 Damon Hart-Davis. Hosted by ExNet.